To my absolute astonishment I have managed to get my daily intake of tea down from at least six cups – to maximum two. 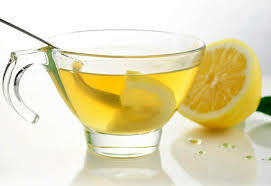 The rest of the time I have warm water with a slice of lemon* – now my preferred beverage on waking, I can’t actually face the idea of tea first thing any more – or steeped fresh ginger, rooibosh, or something herbally. I did it because trying to do a juice detox a few weeks ago I had the worst headache I’ve ever had by 2pm, from not having tea and my consumption of it was just going up and up and up. It’s scarily addictive stuff and I’ve been drinking it since I was three. I had to do something. I don’t want to be at the mercy of ‘needing’ any substance like that, so I decided to show it who’s boss. And I have. I did it by cutting down gradually over several weeks and I’ll be happy when it’s just one a day. I’m not going to go completely cold turkey, because I love the stuff and it would seem like a betrayal of my Granny who I first drank it with, but I refuse to be controlled by it. *If you google it there are five million ways this is supposed to cure all ills. I just like the taste. Feeling in a playful mood, I substituted “gin” for “tea” in your post. It still read as fairly plausible for me (except for the three year old kick off…). I really wish I loved tea, or coffee, or any hot drink – but I don’t. They just leave me cold. Ha ha. The only hot drink I adore is gluhwein, but that is not acceptable during the day when one is trying to wrangle a class of seven year olds. Gin, however, looks just like water…. Dear Maggie, no tea in the mornings – big achievement, congratulations. As I said in my response to Jane above – can’t really talk in the morning till I’ve had one (two really) black tea, milk and 1 sugar. Wonderful your sleep is better as consequence – we all need decent rest to cope.